Chicago has a reputation. Whether it be “The Windy City”, or the home of gangsters and their molls, it is noteworthy. Let us deal with these two accusations first. Yes Chicago is a windy city, sitting exposed on the west side of Lake Michigan, virtually an inland freshwater sea, 307 miles long by 118 miles across. In the winter the cold currents are blown in from Canada whilst for the summer it has to contend with the prairie winds, hot and sometimes sticky. 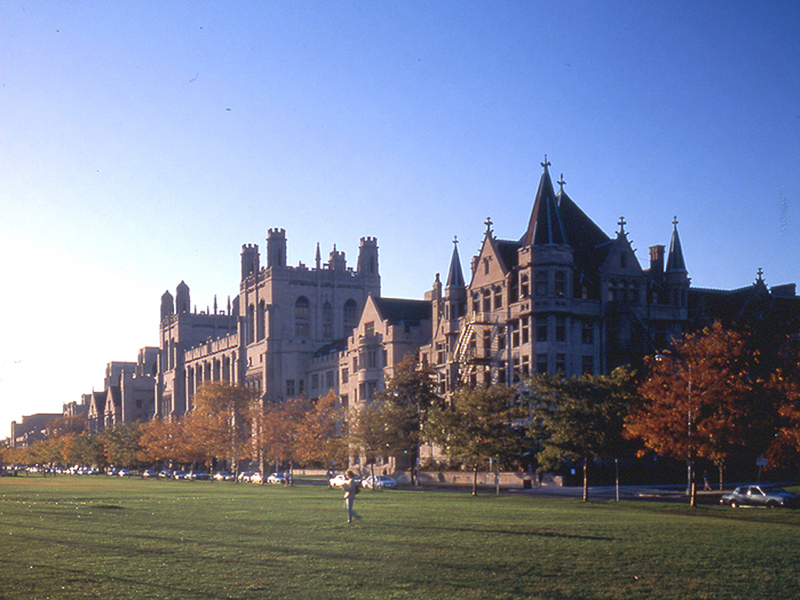 Visit Chicago in the spring and the fall. At these times there is a temperate climate and the long flat avenues and waterside paths make for easy walking. Chicago also conjures up memories of gangsters and their molls, epitomised by the superb musical of the same name, and many a film with the Oscar winning The Untouchables, starring Kevin Costner and Sean Connery, perhaps the best of the bunch. Chicago is the home town of the American President Barack Obama and is a lead contender for the 2016 Olympics. From Heathrow there are up to ten non-stop services a day including American Airlines, British Airways, Virgin Atlantic and the much improved United Airlines. American also flies from Manchester daily. Immigration and customs at O’Hare, arguably (with Atlanta) the world’s busiest airport, is quick and friendly, and the 24-hour CTA train will get you downtown in well under 30 minutes for just USD2. In fact it is best to buy a bus and train pass. Three days travel is only USD14, great value. Even allowing for the new dollar/sterling rate Chicago is cheap (except for the live theatre which can be horrendously expensive). Chicago has as massive selection of hotels as one would expect in any international city. Most of the downtown area is easily walkable and safe and budget accommodation is available. AERBT chose to stay at the Amalfi, very much in the centre of things and close by the Chicago River. With 350 bedrooms it is boutique by American standards and offers spacious rooms, free internet, an excellent self-service continental breakfast on each floor (which you can take back to your room) and a courtesy happy hour in the early evening including a light buffet. Wine, beer and spirits were being downed in large quantities. 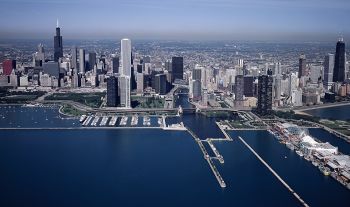 The city of Chicago only dates from 1833, the metropolitan area home to just under ten million making it the third largest conurbation in the United States. In 1871 a fire destroyed the entire business district. One result being the world’s first skyscraper using a steel skeleton construction. AERBT will always recommend a bus tour as a way of getting to know quickly a destination on arrival. Tips can be picked up and suggestions made. Chicago is no exception and one can add the popular river/lake trips which start in April once the ice disappears. We joined a bus and walking group organised by the Chicago Architecture Foundation which took in the University (founded 1891 and host to 82 Nobel Prize laureates to date), the Robie House designed by Frank Lloyd Wright, as well as the massive Art Deco buildings of the jazz age in the central area. Chicago is a world leader in terms of architecture which continues to this day, the waterfront, viewed from the lake, extraordinary. Presently the three tallest in the city (and the western hemisphere) are the Sears Tower, the Aon Center (previously the Standard Oil Building) and the John Hancock Center. 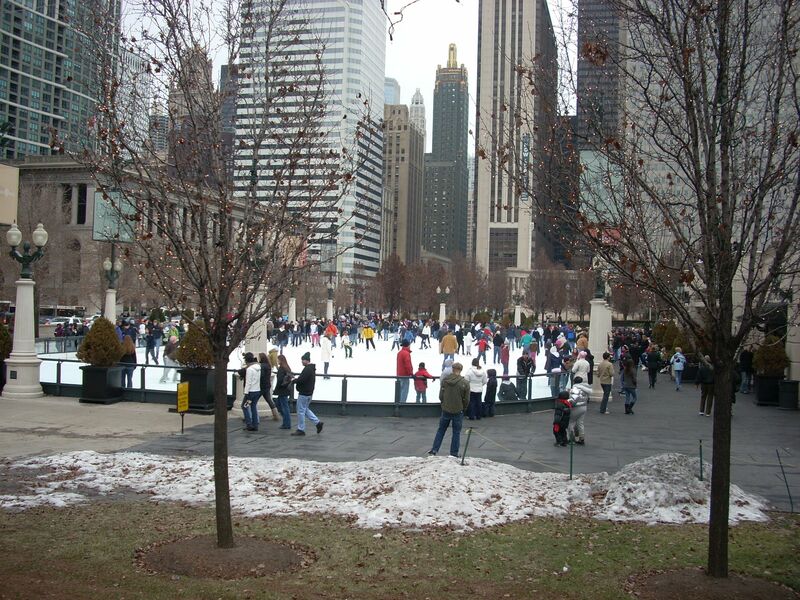 There is more than enough to do in Chicago for both adults and children to easily occupy a week. American and international cuisine is available en masse at sensible prices and entertainment and music is offered in abundance. It is synonymous with Louis Armstrong and at the other end of the scale the world famous Chicago Symphony Orchestra. The Navy Pier, served by a free trolley ride, caters for old and young alike, and includes 50 acres of parks, promenades, gardens, shops, restaurants and attractions. The Field Museum is a magnificent massive neo-classical building on the Chicago waterfront dating from 1921. The words of its incorporation very fairly sum it up: “Dedicated to accumulation and dissemination of knowledge, and the preservation and exhibition of objects illustrating art, archaeology, science and history." It is the home of Sue, the most complete and best-preserved Tyrannosaurus Rex fossil yet discovered. Sue is 42 feet long, stands 13 feet high at the hips and is 67 million years old. There are permanent exhibitions, such as “The Ancient Americas” and time linked ones. Up until the end of October “Real Pirates” is on display. Children are catered for with the Crown Family Playlab and the Underground Adventure. The Field Museum is part of what is known as the Museum Campus which also includes the Shedd Aquarium, at one time the world’s largest, containing 25,000 fish in five million gallons of water. It adjoins Adler Planetarium & Astronomy Museum with its two full-sized theatres. Sports fans will also be interested in the nearby and controversial Soldier Field, home of the Chicago Bears American football team with a capacity of 61,500. Jack Dempsey fought Gene Tunney here in 1927. 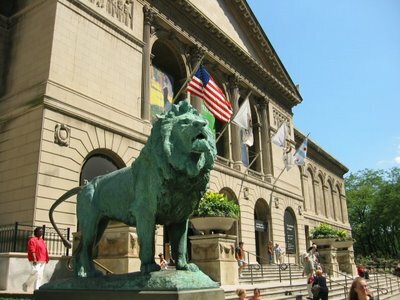 The Art Institute of Chicago is without doubt one of America's premier fine art museums. It is especially known for its extensive collection of Impressionist and Old Master works with more than 30 paintings by Claude Monet, including six of his Haystacks and a number of Water Lilies. On display are important pieces by Pierre-Auguste Renoir, including Two Sisters (On the Terrace), as well as Paul Cézanne’s The Bathers and The Basket of Apples. At the Moulin Rouge by Henri de Toulouse-Lautrec is another highlight, one of many. Lincoln Park, once again on the waterfront, has over 20 million visitors each year, making it second only to Central Park in New York City. The wealth of green space afforded by Chicago's parks is further augmented by the Cook County Forest Preserves, a network of open spaces containing forest, prairie, wetland, streams, and lakes that are set aside as natural areas which lie along the city's periphery, home to both the Chicago Botanic Garden and Brookfield Zoo. The clean and efficient public transport system takes you to all the venues. Cloud Gate on the waterfront in Millennium Park is British artist Anish Kapoor's first public outdoor work installed in the United States. The 110-ton elliptical sculpture is forged of a seamless series of highly polished stainless steel plates, which reflect the city's famous skyline and the clouds above. A 12-foot-high arch provides a 'gate' to the concave chamber beneath the sculpture, inviting visitors to touch its mirror-like surface and see their image reflected back from a variety of perspectives. 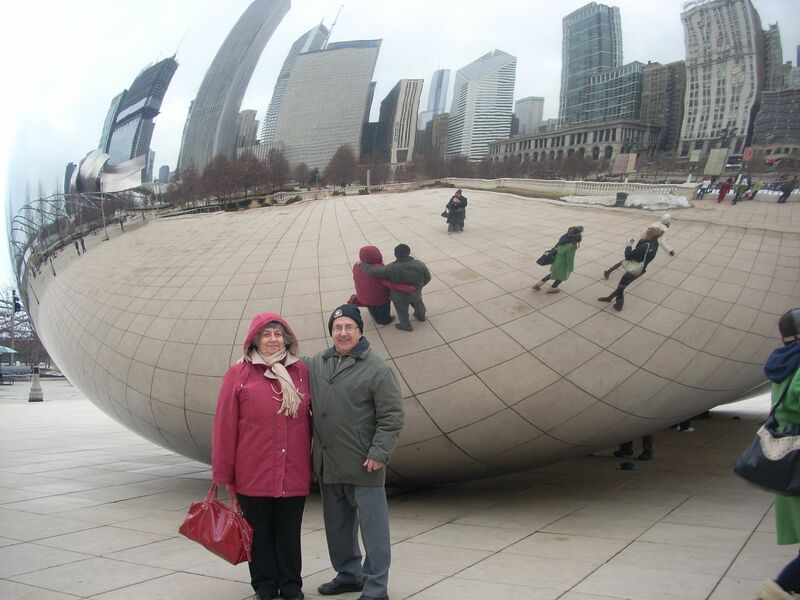 Your Editor in Chief and his wife could not resist having this picture taken on a very cold January day.